Transformers fans are a little bit ridiculous. 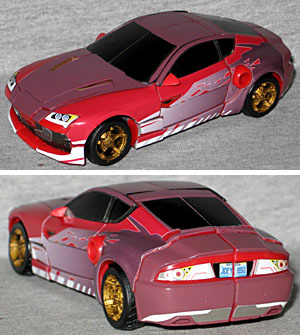 There's an entire contingent of fans out there who will buy a $10 TF, and then spend $50 on a add-on kit to "complete" it. Every time a new toy is announced, there's a flood of comments from fans who just can't wait to see what third-party kits will be available for it. That said, there are some toys that undeniably need an upgrade. 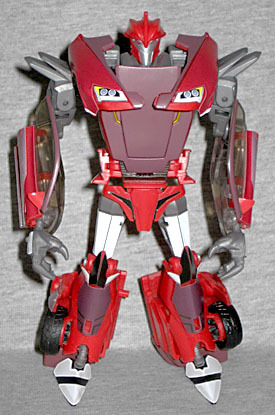 You may recall that in the review of Transformers: Prime Knock Out, we talked about the sorry state of his paint apps. While some characters can get away with corner-cutting like this, Knock Out is a vain, prissy, pretty-boy who cares more about his looks than the Decepticon cause. Releasing Knock Out without all his paint is like releasing Megatron without his arm cannon. Thankfully, Reprolabels was there to make things right, offering a kit dedicated entirely to fixing what was wrong with this little red racer. At $11, Reprolabels kit P4 is not exactly cheap - in fact, it's going to double the cost of your Knock Out. But it makes the toy look so. Much. Better! that you really do need to consider ordering one. For that price, you're getting more than 70 individual stickers, so it's not like you're being ripped off. The stickers really bring the car to life, but as you can see, they spice up the robot mode, too. The stickers took several hours to apply. Down below this review you'll find the two-part instructional video Reprolabels made to walk you through the process. What surprised me most about them was the smell: they're made from vinyl, so they have a distinct, strong odor that will hopefully fade with time. Because right now? Woo! Pungent! Being vinyl, however, makes them durable enough to stand up to repeated transformation without rubbing away or ripping. The color-matching is very close, but not quite perfect - still, it's not a large enough gap for to complain about. Off-the-shelf, Knock Out is merely okay. Putting the Reprolabels kit on him, though, kicks him way up the scale! Just compare the shots in this blog to the ones in the actual review. This was my first Reprolabels order, but I forsee more of my TFs getting upgraded this way in the future. This entry was posted in blog exclusive review, videos and tagged Reprolabels, Transformers. Bookmark the permalink. Check out the one for Ratchet!